TUCSON a ” In the fall of 2011, Khalil Rushdan walked out of prison a free man. Rushdan had served 15 years of a 25-year sentence following his conviction for first-degree felony murder in 1997. That year, Rushdan wasn’t alone when he became a free man. He was one of the 74 people exonerated in the U.S., according to the National Registry for Exonerations. His story, like so many others, is complex. In 1993, Rushdan worked as a middleman for drug dealers and sellers in Tucson. What started as a regular deal quickly turned to violence. Rushdan had left the buyers and seller alone for the transaction and when he returned, one of the buyers had shot and killed the seller. Rushdan fled and it took months for the police to catch up to him, but once the killer went on trial, he agreed to testify as a witness for the prosecution. But, when Rushdan and his family where met with death threats from the killer’s associates, he refused to testify. The killer was acquitted. Months later, Rushdan was arrested in Ohio a ” he had an outstanding warrant for his arrest in Pima County for felony murder. Under Arizona law, individuals can be prosecuted for murder even if they are only indirectly involved. In Rushdan’s case, he had set up the meeting between the two parties, making him legally responsible for the killing. Rushdan was put on trial after the killer was acquitted and after he refused to testify for the prosecution. Convicted and sentenced to 25 years in prison, Rushdan never thought about bringing his case to the Arizona Justice Project until another inmate convinced him to do so. The project worked to free Rushdan on the grounds of prosecutorial vindictiveness a ” with the project arguing that the prosecution targeted Rushdan after he used his legal right to refuse to testify. Since the late 1900s, attorneys across the country have formed local organizations dedicated to freeing the innocent and wrongly imprisoned. In 1998, Larry Hammond, an Arizona defense attorney, started the Arizona Justice Project and it became only the fifth of its kind in the country. Today, there are more than 60 similar organizations across the country. The project started as a group of attorneys hoping to make a difference in the criminal justice system. Over the years, it’s become one of the main offices that handles cases like Rushdan’s, according to Lindsay Herf, the executive director of the project’s anagement team. Rushdan is one of 21 individuals exonerated with help from the project since 1998, and one of 1,020 exonerees since 1989 released due to official misconduct, according to the National Registry for Exonerations. The project doesn’t work only with cases that involve official misconduct, but also with those that involve a claim of innocence. Since 1998, the office has received about 5,000 requests for assistance. Right now, the team has 35 cases with three in court and another three in parole hearings. Investigating each case is no easy task. One of the first tasks for the office is working with experts to see if there is enough evidence to go through with the appeals process. “Cases 10 years ago, that we didn’t think we could do much with, we are now re-examining,” she said. Much of the work that Herf and her colleagues do is investigating the cases to see if there is additional witness testimony and physical evidence like DNA. The exoneration rate has increased rapidly over the past decade. In 2001, 90 individuals were exonerated. In 2016, 160 people found their freedom, the highest year on record. With a steady increase in exonerations, prosecution offices are starting to look at local claims of innocence and wrongful imprisonment with organized conviction integrity units, or CIUs. Employees are tasked with investigating claims and working with local experts to uncover any new evidence. Since 2011, these units have increased by almost five times. Now there are 29 established CIUs across the country and a record 70 exonerations took place because of CIU involvement, according to the Nation Registry of Exonerations. The Pima County Attorney’s Office and other prosecution offices across the country have been doing this kind of work for years only without a designated CIU, said Rick Unklesbay, chief trial counsel. Unklesbay has been with the office since 1981 but retired in 2010. In 2014, Unklesbay decided to take on a part-time position as the leader, founder and sole member of Arizona’s only CIU that works closely with the Arizona Justice Project. “I got intrigued with the idea and talked to (the Pima County Attorney) about it, and we thought, ‘Yeah, we should put this in a unit in the office,’ ” Unklesbay said. Before Unklesbay started the unit, there wasn’t an organized place to have claims investigated. But since the office opened, Unklesbay said only 50 cases have been filed for review, which is why the unit is a one-person show. “It hasn’t been the avalanche of cases that I expected to come in,” he said. Unklesbay said he thinks the reason these units are only now popping up is the attitude some prosecution offices have toward investigating claims of innocence and wrongful imprisonment. Unklesbay said some offices might think that it isn’t the prosecution’s job to investigate these claims a ” or, because they already do investigate, there is no need for an actual unit. “I think the advantage of having a unit is that there’s some specific place it goes to and there’s a person who’s tasked with looking at these cases as opposed to randomly assigning them to somebody in the office,” Unklesbay said. In the end, Unklesbay said he thinks the burden does rest on the prosecution to investigate all of these claims. 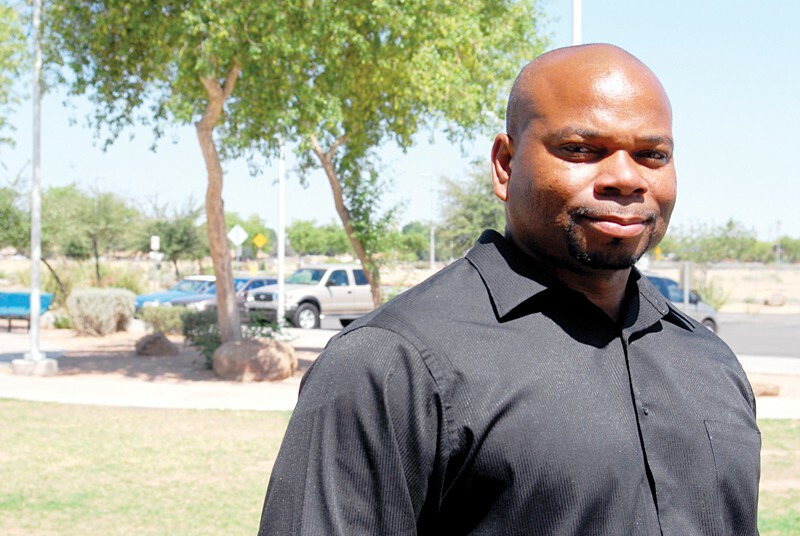 For Rushdan and others like him, organizations such as the Arizona Justice Project and prosecution offices with CIUs give the wrongfully imprisoned a second chance. It’s been five years since his release, and he has turned his life around. Rushdan is an artist. He designs T-shirts to promote re-entry awareness. He said he hopes to sell the desert-themed shirts to help fund his own art and re-entry programs. He also works as a mentor and counselor for individuals re-entering society. After prison, Rushdan said getting back into society didn’t come easy. He was lost when it came to finding a job, technology and getting used to the future he was thrust into. Rushdan hopes the work he does now will keep others from going through the hardship he went through coming back from prison. “I’ll be happy knowing that I gave people effective programming and people can immediately start seeing the change,” he said.